They say if you learn how to make puff pastry, the whole world will be at your feet, Google will be your friend forever and Prince Charming will knock at your door bringing an electric mixer as a gift. Yet, despite all these tempting promises, I'm still not sure I want to attempt such labor-intensive dough, possibly wasting pounds of butter in many trials and spreading flour all over my so-called-kitchen. Yesterday, though, I found this recipe for a semi-puff pastry, described as a good warm-up for those who are thinking of challenging the real deal one day, and I decided to give it a try. The source is Christine Ferber, the jam woman, who few years ago came out with a second book entirely devoted to tarts, both sweet and savory. The result is really excellent, especially since the dough is quite simple after all, and it's also pretty quick to make (not considering the time it needs to rest and the time you'll need to read the recipe and to decipher the explanation of the process to follow). I only have one question left: now that I know how to make a semi-puff pastry, do you think I have to expect a Prince without the mixer or am I allowed to ask for a mixer without the Prince? butter, very cold 150 gr. Sift flour on the work surface. Cut butter in small cubes and add it to the flour, tossing very quickly (in order to have a very cold butter, after cutting it in cubes I put it in the freezer for about 10 minutes before proceeding with mixing the dough). Make a well in the middle, add salt and sugar and a couple of tablespoons of water (which also has to be very cold). Start kneading the dough to combine ingredients, but take care not to overwork it and that the butter bits remain visible. If necessary, add a little bit more water, but in order to have a good result it's better to use as little as possible. Shape into a ball, wrap in plastic and let it rest in the fridge for 20 minutes. Now, lightly dust the work surface with flour, and using a rolling pin press the dough into a rectangle a little more than 1/2 inch thick. Fold it in thirds, as if it were an envelope: fold the top third down and fold the bottom third over it, like wrapping it (much more difficult to explain it than to actually do it, I swear). Rotate the dough 90 degrees to the right, wrap it with plastic and let it rest in the fridge for at least another 10 minutes. From now on, pay attention to keep then same direction of rotation and to keep the same side touching the work surface (again, lots of words that simply mean that you have to put the dough in the fridge and take it out as it was, without turning it over and without rotating it in the opposite direction). Dust the work surface with flour, roll the dough into a rectangle again and fold it in thirds exactly as before. Rotate the dough of another 90 degrees to the right. Wrap it in plastic and put it in the fridge for 10 minutes. Now you have to repeat the process for the third time: roll it into a rectangle, fold it in thirds, and rotate it 90 degrees to the right. This is the third and last fold and it's better to do it the next day. Once you're done with it, keep the dough in the fridge for at least half hour before rolling out the tart base. Take the semi-puff pastry out of the fridge and roll it in a circle of approximately 1/8 inch thick. Prick the surface with a fork. 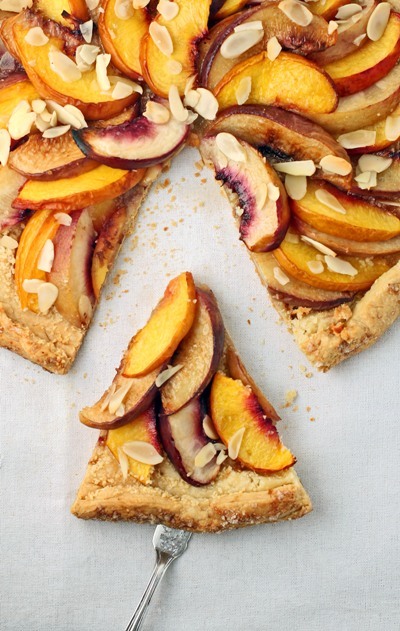 Cover the bottom of the shell with almond flour (it'll help absorbing peaches' juice while baking). Melt the butter. Wash the peaches and the nectarines, dry them with a kitchen towel and cut them in slices approximately 1/8 inch thick. Arrange them nicely on the tart shell, leaving an empty edge of about 2 inches. Fold the edge over the fruit, trying to seal it with your fingers. Brush the peaches and the edge of the tart with melted butter, sprinkle the fruit with brown sugar and the tart edge with regular sugar. Cover with slivered almonds to garnish. Bake at 400 for about 40-45 minutes, until the tart turns golden brown. Let it cool on a rack before serving. Make cleaning, doing laundry, and keeping up your home easy with our helpful صيانة مكيفات بالرياض suggestions. I went online and booked... The website then told me my payment (50 buck fee to hold appointment)... Didn't proceed thru... Which I see other customers experienced the same issue with...(so it is clear the online booking option needs to be improved) But PayPal said it did...but it had confirmed my 3pm appointment online... I was just a little baffled it it proved helpful or not I emailed them to be sure. A mere surface cleanse is never enough in the kitchen, and that is why we at Elegance Care offer you the sophisticated services of extensive stove and oven cleaning, and deep washing of most areas, corners and hard-to-reach areas in your kitchen. $30.00 hr. شركة تنظيف بالرياض مجربه is a lot of hard work. They finished a lot quicker than I thought and they did an excellent job. The training and experience your housekeeper or شركة تنظيف منازل بالرياض مجربه business provides will play a sizable role in identifying the hourly wage you purchase their cleaning work. You won't purchase all washing appointments simultaneously. Otherwise the process of using Amazon Services was okay. I sent an extra person with the crew because they were late and to make sure that they still finish in the same amount of time a team of two would have. Below you can view the way the hourly home cleaning prices charged by private housekeepers and فني صيانة مسابح بالرياض companies varies by city in the US. Perhaps your encounters with this low end businesses that seem never to be in fact certified, leave early and charge you (stealing), helping themselves to things in your home may be the result of you trying to find bargain cleaners. Whenever a company must pay light, drinking water hire workers to answer the telephone provide transportation, provide often three different types of insurance, pay employee benefits , do marketing and advertising طرق تنظيف خزانات المياه along with all the other things cleaning companies have to do how do you think they will make money to keep the business running so you can access services in case you are paying 15-20 dollars one hour.